Find out everything you need to know about ceramic stains! Plus, get a new glaze recipe to try out with your favorite ceramic stains! Nowadays, ceramic artists are spoiled. It wasn’t that long ago that getting the colors and surfaces you wanted took a lifetime of experimentation. But because of developments in modern stain technology, we have practically every color of the rainbow at our fingertips with commercial ceramic stains. In this post, John Britt explains the ins and outs of ceramic stains and shares a recipe for you to experiment with. – Jennifer Poellot Harnetty, editor. Ceramic stains are a mixture of ceramic oxides and coloring metal oxides that are melted in kilns, quenched, ground to specific mesh size (some are acid washed), and colored with organic dyes to simulate the fired color. Essentially they are fritted colorants. They are made and manufactured for several reasons: to provide a consistent and stable form of colorant that doesn’t dissolve in the glaze melt as easily as coloring metal oxides; to make colorants safer to use than raw metal oxides (commercial stains are less soluble in water); to allow repeatable and consistent results with minimal effort; and to allow you to fine tune your color selection to get the color you want at a reasonable cost. They can appear expensive, but time is money. Consider the countless hours of glaze testing that would be necessary without the consistency of a dependable commercial stain, then the prices are more reasonable. Ceramic materials that have been mixed, fused/melted/sintered together in a kiln, quenched, and ground to a specific size. They can be used as part of a glaze recipe (e.g. Ferro frit 3134) or added to coloring oxides, or ceramic stains to assist in melting. Mineral with alkaline oxide and amphoteric oxide. RO/R2O3. Gemstones are an example of natural spinels while in ceramics, these spinels are used to produce commercial colorants because they are chemically stable in molten glass. A purple can be created by combining cobalt and alumina oxide, CoAl203, into a cobalt aluminate stain. 1) Coloring oxides suspended in water (a.k.a. an oxide wash). May also contain frit and/or kaolin (usually EPK). 2) Commercial ceramic colored powders that are used in glazes, clay bodies, and slips/engobes. 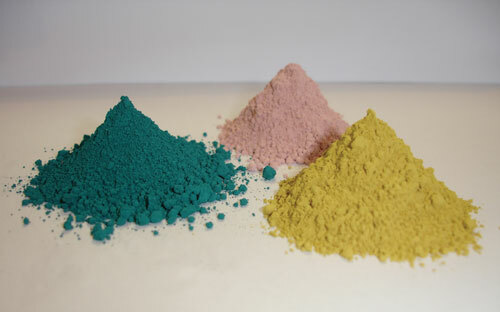 Prepared coloring oxides that are fritted, reground, and colored with organic dyes to simulate fired color. Historically, potters made glaze from feldspar, ash, and whatever iron-rich clays were available locally. This usually meant brown pots, or occasionally another earth-tone color. Then they began using metal oxides—like copper oxide, chrome oxide, manganese, iron oxides—and blending them with opacifiers to create colors. There is historic evidence that colored frits were used at least as early as 2600 BCE. Egyptian blue was a combination of silica, limestone, sodium, and copper oxides. This required a great deal of knowledge about glaze chemistry and firing to achieve the desired colors. And this knowledge was something that was in short supply, so potters basically accepted the glazes they stumbled upon and liked enough to build a body of work around. In addition to stunning images and inspirational stories, Ceramics Monthly delivers practical technical information like John Britt’s in-depth review of ceramic stains. Commercial stain companies provide a detailed list of what oxides are present in each stain (check out our directory to find ceramic stain suppliers!). The exact recipe is proprietary, but knowing what oxides are used in a given stain can give you great clues as to how a color is achieved or how to encourage or prevent particular effects. For example, there are several different black stains. One is Best Black while another choice is Cobalt-Free Black. If you are using a white glaze with a black-stained glaze next to it, you may notice that a blue line develops at the overlap. If you don’t want that line, you can look in the stain chart and choose the black stain without cobalt—the cause of the blue line. This chart also tells the base glaze structure that is necessary for each stain to work. Before deciding on a color, it is advisable to look at the reference notes associated with that stain. Sometimes called the Base Glaze Guide, this information indicates the specific requirements to achieve each color. For example, the name is listed, followed by the oxides it contains, and finally a list of numbers such as 3, 5, and 9; each indicating information important to the mixing, firing, etc., to that stain: #3: Maximum firing limit 2300° F (1260°C), #5: Do not use zinc in glaze, and #9: Glaze must contain 6.7–8.4% CaO (12–15% CaCO3). Each manufacturer will have a full list of reference notes for their ceramic stains. Each color is not guaranteed in all bases, and being aware of these reference notes will help you achieve greater success. Ceramic stains are not meant for all firing conditions and are generally designed for neutral or oxidation firing atmospheres (although some may work in reduction atmospheres). Because ceramic stains contain coloring metal oxides along with other ceramics materials like opacifiers, silica, and alumina, adding them to certain glaze bases can cause a glossy glaze surface to turn matte. Ceramic stains are generally added at 5–8% in a glaze and 15–25% in slips and clay bodies. At 8% most of the glazes are opaque and flat but if you add smaller amounts of stain (1–3%) it is possible to get transparent colors, including some very nice transparent celadon-colored glazes, when fired in an electric kiln or similar neutral atmosphere. Specialty stains, called encapsulated stains, allow potters to get colors that were once not possible with traditional ceramic stains. These stain types, also known as inclusion stains or inclusion pigments, are zirconium silicate with cadmium sulfoselenide crystals (Ca/Se). Dave Finkelnburg explained in his article, “Four Ways to Red” on pages 14–15 in the April 2011 issue of CM, “The discovery of the encapsulation process (the melting of the colorants into a zirconium silicate glass at high temperatures) has now made the many hues of yellow through red reliable at temperatures through cone 10 in both oxidation and reduction atmospheres.” The addition of 3% zirconium silicate will produce an even brighter color. These stains are refractory at higher temperatures, they do not melt much, if at all. As Tony Hansen writes on Digital Fire (www.digitalfire.com), “Encapsulated stains are not, as the name suggests and some misunderstand, a zircon capsule around an otherwise unstable compound. Rather they are manufactured by sintering to form a crystalline matrix (in a process called encapsulation).” Inclusion stains have specific firing temperatures and duration of firing protocols as well as warnings about not ball milling the stains (which will allow release of cadmium and/or selenium). If the fired glaze surface is damaged it can release the crystals. Finkelnburg also states that cadmium stains can produce food-safe colors; however, under certain circumstances, it can be leached from the fired glaze. He adds that a sample of any cadmium-stain-tinted glaze used on potential food surfaces should be tested for leaching by a qualified laboratory. Washes made with commercial ceramic stains can be used both over and under many glazes. Mason Color Works recommends mixing 85% stain and 15% Ferro frit 3124 as a starting point, but many potters us a 50% stain and 50% frit ratio with good success. 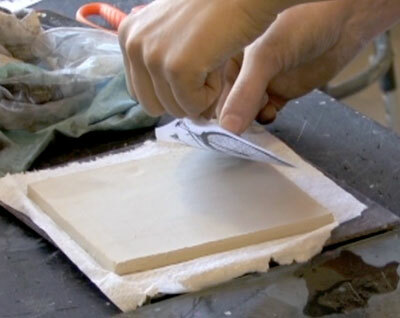 When used under a glaze, cover with a transparent or semi-transparent glaze. When used over a glaze, be sure to have sufficient flux in the mix because if the stain or wash is too thick, it can turn into a crusty surface after the firing. A very popular use of washes is on majolica-glazed work. Potters using majolica often mix 50% stain with 50% frit or Gerstley borate to brush designs on top of the white majolica-base glaze. If the ceramic stains are refractory, as listed by the manufacturer, increase the flux—use 1 part stain and 4 parts frit or Gerstley borate. acid, Add:, alkaline, alumina, artists, ash, base, bases, body, brush, celadon, ceramic, ceramic artists, ceramic materials, ceramic oxides, ceramic stain, ceramic stains, ceramics, chemistry, chrome, chrome oxide, clay, color, colorant, colorants, colored, colors, combining, cone 10, copper oxide, crystalline, designs, electric kiln, epk, feldspar, ferro frit 3124, ferro frit 3134, firing, form, frit 3124, frit 3134, gerstley borate, glaze, glaze melt, glaze recipe, glazes, guide, images, inclusion pigments, iron, iron rich, john britt, kaolin, kiln, majolica, manganese, materials, mixing, natural, neutral, neutral atmosphere, oxidation, oxidation firing, pots, potters, recipe, reduction, refractory, safe, short, silica, sintering, size, spinel, stain, stains, surface, surfaces, technical, technology, time, traditional, transparent glaze, wash, washes, water, zinc, zirconium silicate. commercial stains can be used both over and under many transparent printing glaze. Six Star Ceramic Colours is a top brand of ceramic pigments suppliers in China, we are the one of few real manufacturer can produce ceramic glaze inclusion pigments.Six Star Ceramic Ink is China’s own ceramic digital ink for ceramic tile colors, no guy wire, no print-head blocking, no precipitation.Professional ceramic glaze suppliers produce ceramic on-glazes for bottle, clay glaze and pottery glaze. Not all stains are spinels, there are also those based on the zirconium silicate structure with some of the zircon replaced by colouring oxide. This type includes vanadium turquoise, praseodymium yellow and iron zirconium coral. A third type is chrome-tin pink, which has a different structure not as stable as spinels or zircon.